So they say that it’s better to give than receive, but after some of the things that have been coming to my mailbox lately, I’m not so sure. I’ll have to get back to you. I’m going to "give" at the end of this post, so I’ll let you know which feels better! First of all my dear long-time blogging friend Kristen, sent me a nice little package a few weeks ago. In it were some of her fabulous fabrics, which are the nicest fabrics that have ever graced my fabric shelves, along with a MollyBirds print, in a new (my favorite so far) colorway. Who knew a little woodworking project could inspire something so great? Kristen also sent along two pads of her new line of papers. I love them and I’m beating my children off with a stick to keep them away from them. They’ve got sticky fingers those girls so I’ve taken to hiding them in different places around my desk. And Kristen, for the record, Happy Belated Birthday! I made you a video message to send as a little "gift", but I chickened out. I’m working on "take 2". Thank you, friend! You know what I love. As if that wasn’t enough, Molly,(whose new banner I love), my dear blogging friend and new penpal sent an extra large "letter" in the mail for our last exchange. In it she included this cute little puzzle wreath, these books that she scores at her "friends of the library" sales (I’m jealous), and some homemade marshmallows. 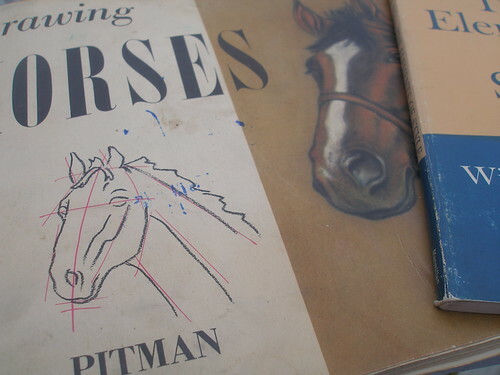 Molly, the books were key–especially the horse-drawing one. I’m not turning it over to Emma quite yet because apparently my horses aren’t "real-ish enough" these days. I need some lessons. And last of all, one night when Dan was well into dreamland, I was up late on the computer and somehow stumbled upon the etsy shop DoggiePiggie. I’m not one for impulse buys, but as soon as I saw these animal tracks alphabet cards, I knew I needed a set for me, (I mean, the girls.) I love them. I’ll probably somehow use them to decorate in their new room. And tonight I see that the shop owner at doggiepiggie was holding out on me!! She now has a Memory Card Game, Counting Flash Cards, and great sets of flat and folded cards. Her profile says she’s combining her love of science and art. I think they’ve come together beautifully. Now for the giving….I’ve somehow managed to have an extra copy of Amanda’s Creative Family book. And I would love to give it away to someone who doesn’t have a copy. If you are a mother, auntie (uncle? anyone? ), grandmother….you should be reading this book. I can’t tell you how many times Amanda’s words come back to me throughout my day. Leave a comment indicating that you’d like your name in the hat. I’ll pick a name later in the week. You can read my review of her book here. I actually have two other books to give away, but I’ll save them for another post soon. This turned into a longer post than I anticipated. 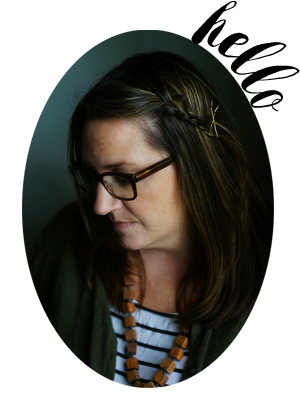 I gave the bloggity-blog a facelift today. I just needed something new. This was different. The seasons are changing and I get blog-design-ants-in-my-pants. I feel much better now. Yes! Please add my name in the hat. Her book has been on my wish list forever!I like the new look. I love the new banner. I just changed mine a few weeks ago and keep thinking that my font is too small, but I haven’t heard any complaints yet. As for yours I think it looks just fine, so maybe mine is too I guess. Geez, enough rambling? oh, I want my name in the hat. Love your blog, you inspire me! That fabric is wonderful isn’t it, I have a piece too. And those track cards… oooh. Pity my daughter is too young (10 months), but maybe we can just keep them for later? Of course we can.I would love to be put in your hat for the draw, my library doesn’t seem to even have it listed. Sigh. I love the blog’s new look – I noticed it right away. I think the font size is fine and your banner is stunning. darlin’ fabric and notepads. 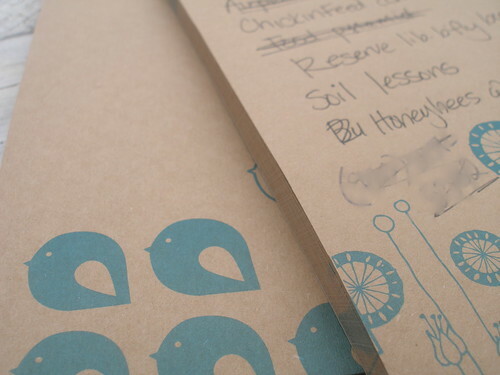 LOVE those notepads. Can’t ever have enough of them.Nice fresh looking page, Molly! Please throw my name in for the book! I love your blog and am delurking for a chance at this great book. I was hoping you hadn’t changed the banner. I love that photo, the colours, the girl and everything. And of course, I would love my name in that hat. Love those track cards. I’m adding them to a list for the urchins. i have a copy already, inspired many times. have fun giving and receiving! I’d love the book. How generous of you!! Love all your gifties. 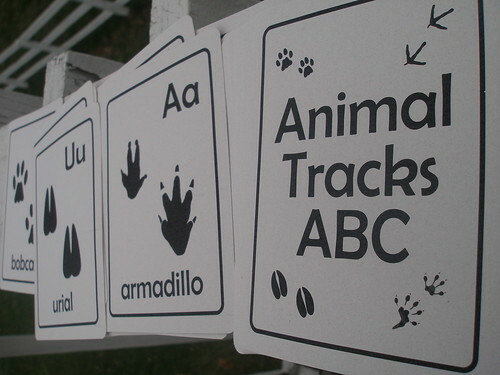 And I can’t wait to check out the animal track alphabet cards. I did find the font a little small, but then I’ll be “over 35” in a few weeks. Lol. ooohh. yes. yes. please! I still need to get Amanda’s book. Oh, goodness, I would love my name in that hat– that would be wonderful. I love the new banner– very spring to me! I love Amanda’s book and I’d love to own a copy so please put my name in the hat. Love the new banner! Please add my name to the hat too! Oh – please add my (delurked) name to the hat – I’ve asked our library to order a copy and put my name on the hold list but goodness only knows how long THAT will take ;).And I love the new banner – green finally –ahhhh, it was a very long winter. font looks nice too. Ooh! I’d love to be in there. I haven’t been able to find it anywhere local and haven’t yet ordered online. That bird fabric is so perfect. I love it! I have to say that I, too, love your new header! The colors are so great together! I’d love to be thrown into the give away, if you don’t mind:) I keep looking at Amanda’s book but just haven’t had the chance to buy one. Maybe I’ll get lucky (stranger things have been known to happen:). Thanks for the generous gift. i would love to have this book! please put my name in the hat! i’m a big admirer of crafting mommas and have been meaning to buy that book, but if i win it that would be so awesome! Ooo, I have been trying to earn credit by selling books to my local bookstore to get this book, what a treat it would be to win! Thanks! Such a lovely banner and a lovely post. Please add my name to the hat…thanks! I thought I left a comment but it wasn’t there when I check. So sorry if this is a repeat. Please put my name in your hat. It’s not in our local library yet. But I am from Singapore. Hope I still qualify!! Thanks!! I could really use this book. I teach preschool at my home and many of the things in this book could put a new prospective on my lessons. Pick me! I would love the book for me! My wee library is ordering it but they say it could be months! I feel like I am out of touch with the world! crossing fingers! Hey Molly, I love the new look of the blog, especially the new banner!Those animal track cards are so cute, so is the fabric, you lucky girl. Wow. What nice mail you have been receiving. I will miss your little biker on the banner, but like the new one too! Would love to have my name in the hat for the book. Oh Fun!! Please put my name in the Hat! :) And thanks for sharing the flashcards, I think I shall be ordering some soon! Or making some. Looks like a fun project. Mommycoddle and SouleMama are the first two blogs I read every morning! Seriously! I would love to have my name in the hat. As for your last post, I have a sign that says Music helps you learn big and in my kitchen. My 8 month old loves music, playing piano and guitar! Hopefully it will stick with him until he is old enough for lessons. thanks!!! Oh, I’d so love a copy, but I do live in the UK, so perhaps that won’t work for you. I have been reading your blog for a while now and love it, but am shy to comment without having my own blog. You are an inspiring mother for someone who is just starting out! I like your new blog header – mine is so overdue for a change. It’s funny you mention this book – I borrowed a copy from the library and haven’t been able to finish it because it’s due back. Please put my name in your proverbial (or not?) hat. After reading your review of this book, it sounds like one to savor. It would be great to have a copy of my own to dog-ear. I stumbled on your blog several months ago and check back regularly for inspiration on living an intentional life. My son is 14 months now and I want to teach him to love creating things just for the wonder of it, but also for appreciation it brings to nature and all of God’s creation. It would be great to be able to receive a copy of the book as I try to teach myself how to cultivate creativity in our little family. Molly, the fabric turned out wonderful!!! It also looks nice and thick. Have you had any ideas what your going to make with it? I love the paper, I’ll have to go check it out! Please add my name to the hat!Thanks! I have a copy of the book already but just wanted to say that I too love the new look of your blog! Love the banner and color. Sweet. And the links on the side. You WERE antsy! hee. And look at those alphabet cards. Those are adorable. I need, need, need this book! It’s making me crazy. I will be having my first child next week (hopefully) does that count as being a mom? LOL! Either way, love your blog…don’t think I’ve ever commented but been a lurker for awhile. 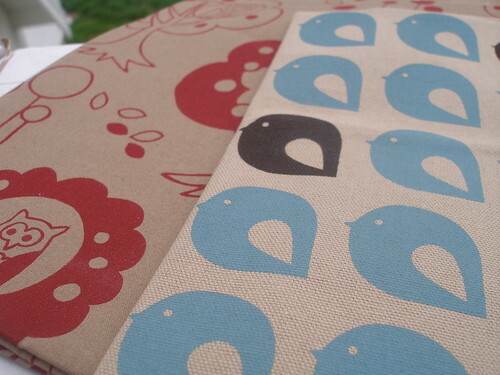 I love that bird fabric! I also love the springy new header. I would also like to throw my name in the hat. It’s a must have book! Those alphabet cards are cute!! I’m gonna have to check those out. I would love the chance to win the book – how awesome! Thanks for the opportunity – and thanks for sharing your cool goodies today! Beth B. (tired mommy to a busy 4.5 yr old). Thank you for the chance to win Amanda’s book! Please put my name in the hat. 🙂 Happy Thursday to you and yours! I would love my name in the hat! I’ve really been wanting this book! I love the new header. I have been coveting this book since it came out. I’m a crafty mum of two sweet girls – 9 and 7 – and I would so like to expand our cache of ideas! I would SO love to have my name in the hat for that book! Oh, I very much want a copy of that book! Thanks for giving your extra one away. Oh, I very much want a copy of that book! Thanks for giving away your extra copy. Cute fabrics! I had seen the Mollybirds before, but didn’t know they were inspired by you! How cool! I *have* to get the wildlife abc cards and memory game. As a former wildlife biologist, it’s a must! Thanks for the link! I soooo would appreciate and love to win the book!! The reviews of it are fabulous!! You received such wonderful gifts!!! Lucky you!! Beautiful new banner! Green and orange and yellow– hints of summer to come. I’d love to be in the drawing for the copy of Amanda’s book. Thanks! Just wanted to say, I LOVE the new look! I bought myself Amanda’s book for my birthday on Tuesday so I don’t need to enter the contest. *I* feel so refreshed from your freshened up look. love the ‘new look’! very fresh…i’m a loyal lurker/fan. love it! I would love to win Amanda’s book. I’m on a very long waiting list for it at my local library. Count me in. I’d love a copy of her book! I would really love this book, please pop my name in the hat! Love those alphabet cards too- very cute! Love the new banner and your blog in general. I’d love a copy of Amanda’s book too! Thanks. Hat, meet name!I don’t know if I qualify since I bought the book already but I’d love to give a copy to my mother for mother’s day. Is that tacky? it looks like i’m not the only one who doesn’t have that book! thanks for the banner love 🙂 i like yours too! so glad you liked the marshmallows – we just took a batch camping with us and there is NOTHING like toasted homemade marshmallows. let me know if/when you’re going camping and i’ll set you up. I have been patiently waiting for my birthday for this book… but it’s months away! Please include me — I can’t wait to be inspired! Oh, I’d love a copy of Amanda’s book! I’m enjoying reading your blog and her blog as much as I can. I’m inspired daily by your posts and family. Thanks! I’d love to have my name added to the hat! I now covet those animal track cards, but I can’t justify taking up another wall in my toddler’s bedroom (haha) for more cards- we already have several gifted sets of Eeboo cards in there! I would love a copy of the book. It looks like you received a lot of nice goodies in the mail. I love your pictures in the newer post esp. the sunset with the trees and everything else. I would love to be entered! I have not yet made it out to purchase the book, but have been looking forward to reading it!